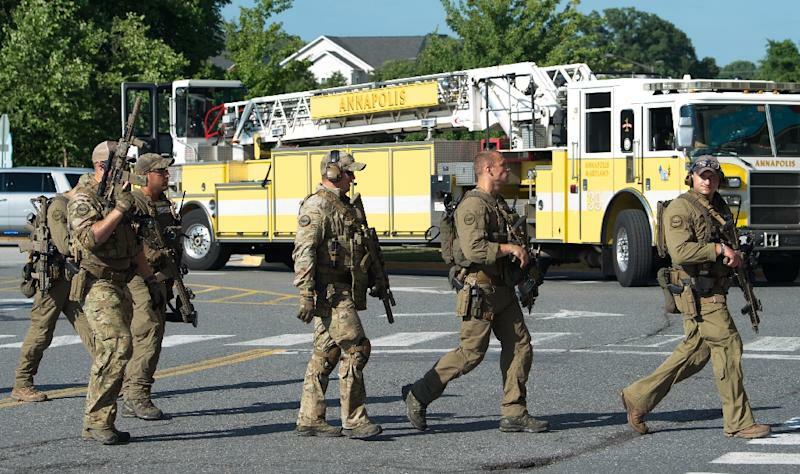 Washington (AFP) - At least five people were killed when a gunman opened fire inside a newsroom in Annapolis, Maryland on Thursday. The suspect -- who was being questioned in custody -- was described as a white adult male armed with a rifle or a shotgun, who appeared to have acted alone and whose motive remained unknown. A 64-year-old retired accountant shoots down from his hotel room at a crowd attending an outdoor country music concert on October 1, 2017, killing 58 people and wounding around 550 before committing suicide. It is the worst mass shooting in modern US history. A heavily-armed gunman opens fire inside a gay nightclub in the city of Orlando on June 12, 2016, killing 49 people. The attacker is killed in a shootout with police. He pledges allegiance to the Islamic State group, which later claims responsibility. A 26-year-old man who was court-martialed while in the Air Force shoots dead 26 worshippers during Sunday services and wounds at least 20 others at a Baptist church in the small rural community of Sutherland Springs outside San Antonio, Texas, on November 5, 2017. The shooter flees and is later found dead in his car with a self-inflicted gunshot wound. A 19-year-old former student at Marjory Stoneman Douglas High School who was expelled for disciplinary reasons returns to the school in Parkland, Florida, and opens fire on February 14, 2018, killing 14 students and three adult staff members. In November 2009, a US army psychiatrist opens fire at his military base in Killeen, Texas, killing 13 people and wounding 42, before being overpowered by police. A young man wearing body armor opens fire in a movie theater showing a late-night premiere of a Batman film in Aurora, Colorado in July 2012. Twelve people are killed and 70 wounded. He is sentenced to life in prison.